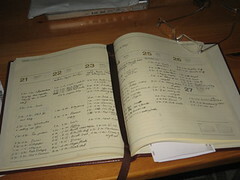 Two weeks ago I started my anti-procrastination strategy and bought a diary to record where I was spending my time. Dinner out with friends = twice/week. No matter that the rest of the time was spend working on projects and I am on holiday - it was more time off than I thought. And I wonder how much I make myself a prisoner of time by constantly talking about the lack of it. I certainly make myself bored by talking about it! 1. Fine thanks. And you? 2. Wonderful thanks. I had a great cycle ride this morning. 3. It's going very well. I've had some time for reflection this week. 4. I'm fine thank you. The Serra is looking beautiful at the moment. All the flowers are out. 5. Very well. I've been enjoying the varanda lately. 6. I'm well, and you? Very busy? Pity ... I've been enjoying some wonderfully relaxing moments. After all, I have all the tools, a fast computer with high-speed connection to the Internet, and applications that help me do things quicker than ever before. Therefore I must have more time!! We have to spend part of our days retooling and if you don't do that you're not able to take advantage of the opportunities that are available out there. It's not just going to come in a package on your desk. It's something you need to do with your mind. Harold Rheingold, for who doesn't know, is worth listening to as he is one of the orginal and currently leading thinkers on the cultural, social and political implciation of modern communications media. It's the social part of the technology that I think is the tricky part. You can buy a manual and figure out how to make the machine work but the human communication the human working together part that involves a lot of other things that aren't in the manual. Oh yes! "Technology" is such a concrete thing for people to get their minds round. You know how to use it or you don't. It is a unit that has a price. It has a shape and takes up space. It's much easier to grasp "the technology" or the "how to ... " of the technology than it is to make sense of people just talking.